Turn your classroom into a gateway for learning about the world. By using online resources and new media tools for connecting, you will help your students see themselves as global citizens. One of the fastest ways to expand your students' horizon is simply to connect your class with students who live somewhere else in the world. You can find willing partners on social-networking sites that cater to educators, such as Classroom 2.0 and the Global Education Collaborative. Once you find a partner, host informal get-acquainted videoconferences between your classes using Skype and a webcam. Tools like Google Earth will give students a street-level look at each other's neighborhoods. With TagGalaxy, you can turn photos from your distant communities into a visual representation of the world you share. Go deeper with global learning by taking part in a more formal international project. An organization called ePals offers a classroom-matching service along with an online language translator. Journey North connects classrooms from the northern and southern hemispheres for inquiry-based projects that deal with seasonal migration. Rock Our World is an international project in which students on every continent collaborate to compose original music, make movies, and meet each other in live videoconferences. 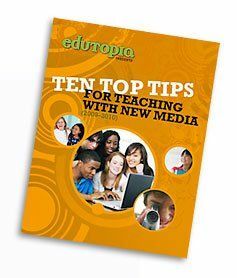 Ten Top Tips for Teaching with New Media: Download more useful information. Collaborative tools can also help your students take advantage of distant experts. Through the Global Citizens Corps, an initiative of the Mercy Corps, students can connect with other youth who share their interest in tackling global poverty, or pose questions to field experts working in hot spots around the world. Cyberschoolbus is a global education project of the United Nations. Interactive games, WebQuests, and other resources promote global citizenship. The Center for Innovation in Engineering and Science Education sponsors global, collaborative projects in which students act as citizen scientists. Projects involve gathering, analyzing, and contributing real data from around the world relating to everything from household water usage to schoolyard habitats. "Global Education on a Dime: A Low-Cost Way to Connect", from Edutopia.org, offers more ideas.